Wisconsin Historical Markers: Marker 154: "Kissel"
The Kissel Motor Car Company was located across the river from this site. 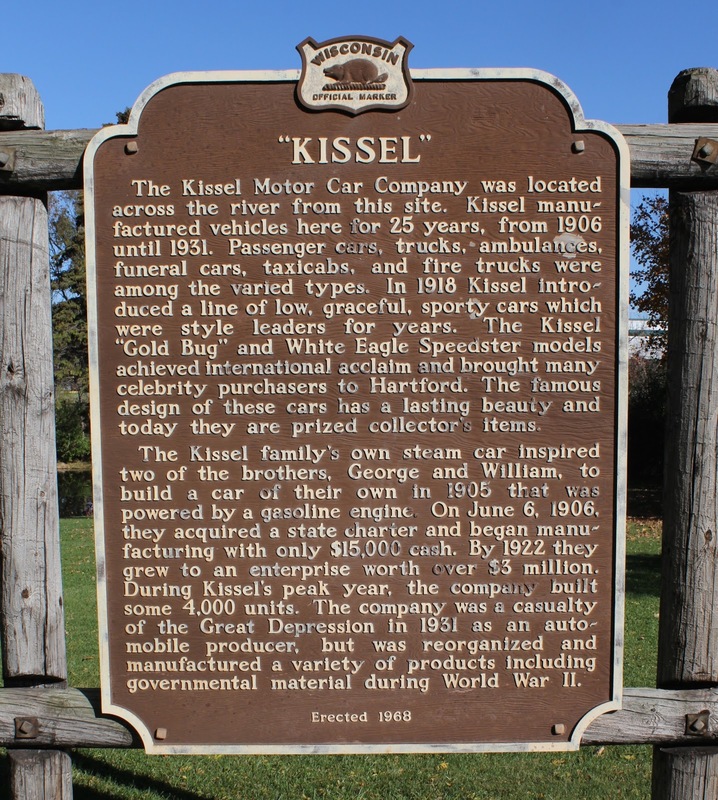 Kissel manufactured vehicles here for 25 years, from 1906 until 1931. Passenger cars, trucks, ambulances, funeral cars, taxicabs, and fire trucks were among the varied types. In 1918 Kissel introduced a line of low, graceful, sporty cars which were style leaders for years. The Kissel “Gold Bug” and White Eagle Speedster models achieved international acclaim and brought many celebrity purchasers to Hartford. The famous design of these cars has a lasting beauty and today they are prized collector’s items. The Kissel family’s own steam car inspired two brothers, George and William, to build a car of their own in 1905 that was powered by a gasoline engine. On June 6, 1906, they acquired a state charter and began manufacturing with only $15,000 cash. By 1922 they grew to an enterprise worth over $3 million. During Kissel’s peak year, the company built some 4,000 units. The company was a casualty of the Great Depression in 1931 as an automobile producer, but was reorganized and manufactured a variety of products including government material during World War II. 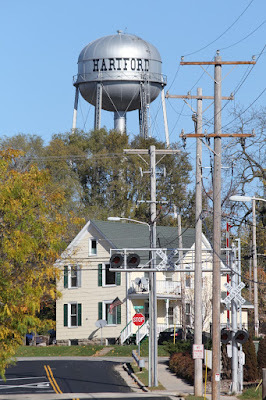 The marker is located on westbound East Summer Street / Wisconsin Highway 60 / County Road K, between Ewing Avenue (to the east) and 4th Street (to the west), Hartford, Wisconsin 53027. NOTE: The only parking is next to the tennis courts on Ewing Avenue (see photo below), then walk west several hundred feet across the grass to the marker location. See also, Animals in Motion, also at this location. At the base of the marker . . . Looking west, with East Summer Street visible to the left. 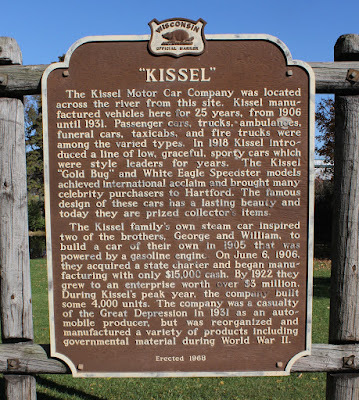 The Wisconsin Automobile Museum houses numerous Kissel cars. then walk about a hundred feet across the grass to the marker location. The marker is located in Hartford, Wisconsin.